Caleb Belmont of Middlebury, Indiana, will graduate from Taylor University with the Class of 2019 with a degree in mathematics. 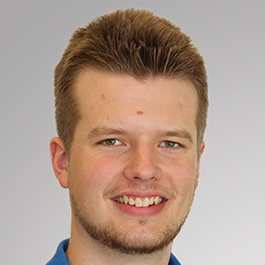 Caleb started interning at the Everence® headquarters in Goshen during the summer of 2018. My project this summer was to analyze data in MailChimp for all the campaigns that have been done over the last three years. After weeks of analysis, I organized the data into a structure that can be used. I enjoyed working in the marketing department. I got to know everyone past the surface level. I also appreciated the welcoming and supportive environment at Everence. What is the most valuable thing you’ve learned through your internship? I’ve had real-life problems to work through. I was very involved and was able to dissect something big into smaller steps because I had the time and resources to do so. I wouldn’t be able to get the work I did in a classroom setting.